Natural gas pipeline development is indispensable for Europe as a whole and for SEE in particular. Such projects are designed to diversify the gas supply and delivery routes for Europe on the one hand, and reduce the dependence of the region on Russian gas, on the other. Russia is the dominant gas supplier for the entire continent, its gas representing 25% of gas imports in the EU alone. Apart from these major considerations, SEE could also benefit from developing alternative gas pipelines, which will result in an upgrade of the region’s old and ineffective energy infrastructure. In light of the ever-insufficient gas reserves in many countries, not only European states but also gas majors such as Iran and Russia might be forced to import Caspian gas. The Azerbaijani Shah Deniz gas field, located in the south Caspian Sea, could solve Europe’s gas shortage problems. It is operated by the same-name consortium between UK oil and gas giant British Petroleum (BP), and the State Oil Company of Azerbaijan, SOCAR. The consortium is currently developing the Shah Deniz Stage II project that is expected to yield about 25 billion cubic metres (bcm) of gas per year. The project could help open the Southern Gas Corridor, an initiative of the European Commission. The goal of the Southern Gas Corridor is to provide gas supplies from the Caspian region and the Middle East to Europe and it consists of multiple energy projects, such as Nabucco West, Trans Adriatic Pipeline (TAP) and South Stream. Two major pipeline projects were pitching to secure gas supplies from the Caspian field – Nabucco West and TAP. They have offered to carry 10 bcm of gas annually to various central and southern European markets. The Shah Deniz consortium made a decision at the end of June 2013, preferring TAP over its rival Nabucco. However, this does not mean that the Nabucco West pipeline project is over. Both projects will be needed in the near future and Nabucco’s route is still to be discussed, according to European Energy Commissioner Guenther Oettinger. The forthcoming opening of the Southern Gas Corridor is more important than the choice of a particular pipeline. Once the internal energy market is functional and efficient, the gas that has reached the European Union will be easily transported across the continent. The approximately 870-km TAP will transfer natural gas from Azerbaijan, via Greece and Albania, across the Adriatic Sea to southern Italy and finally to Western Europe. It will connect with the Trans Anatolian Pipeline (TANAP) close to the Greek-Turkish border, at Kipoi. TAP’s initial transportation capacity will be 10 bcm, but it might subsequently be raised to 20 bcm per year. The gas is projected to begin flowing in 2019. The joint venture company operating the project is Trans Adriatic Pipeline (TAP) AG and its shareholders are Swiss Axpo, Norwegian Statoil and German E.ON. 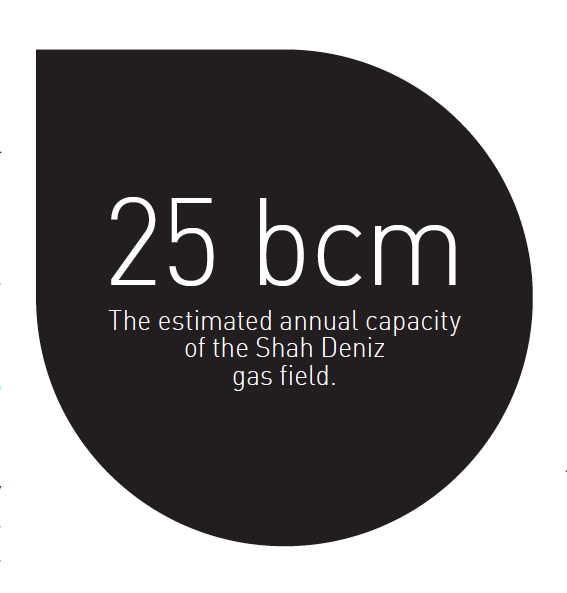 Statoil also has a 25.5% participation in the Shah Deniz consortium. TAP provides various interconnection possibilities with already existing and planned gas infrastructure. It could connect with planned pipelines in the region such as the Intercon-nector Greece-Bulgaria Pipeline (IGB), the West Balkan Ring and the Ionian Adriatic Pipeline (IAP). According to an unnamed expert from Azerbaijan quoted by Reuters, TAP is expected to cost about 7.5 billion U.S. dollars, which is 500 million dollars less than Nabucco. TAP owners declared that the project would not require public subsidies or grants and therefore will not be a burden on taxpayers. TAP also has another advantage over Nabucco in the race for the Caspian gas. Azerbaijan would rather avoid any conflict with Russia, which might have tipped the scales in favour of TAP. This is because TAP will not pass through territories in the Russian sphere of influence. TAP has defeated Nabucco on seven out of eight evaluation criteria, according to Italy’s Industry Ministry. These are market opportu-nities, timing, scalability, management operability, funding available, project quality and transparency. The choice of a pipeline to transport gas from the Caspian region is historical because 10 bcm of gas will be delivered to Europe on an annual basis and this is expected to happen before 2020. Nabucco West is one of the main projects in the Southern Gas Corridor and is operated by Vienna-based Nabucco Gas Pipeline International GmbH (NIC). NIC initially had five partners – Bulgarian Energy Holding, Turkey’s BOTAS, Romania’s Transgaz, Hungarian MOL’s unit FGSZ and Austria’s OMV. In May 2013 French power giant GDF Suez became the sixth partner in the project. The Nabucco West pipeline is planned to start at the Turkish-Bulgarian border, crossing Bulgaria, Romania and Hungary and will reach one of the biggest gas hubs in Europe in Baumgarten, Austria. Nabucco is seen to cost less than 8.0 billion U.S. dollars. If the 1,329 km long route of Nabucco West is completed, the annual capacity of the pipeline will be between 10 bcm and 23 bcm. The construction of the pipeline is supported by an intergovernmental аgreement between Austria, Hungary, Romania, Bulgaria and Turkey, signed on July 13, 2009. 32% of the pipe will pass through Bulgaria, 36% through Romania, 29% through Hungary and 4.0% through Austria. In Turkey, Bulgaria, Hungary and Austria, parts of the route will follow already existing pipeline routes similar to TAP. The Turkish section continues to be part of the route of the initial Nabucco project. Its length will be 2,581 km. In June 2012 Shah Deniz gave the green light to Nabucco West to compete with TAP for securing Caspian gas supplies to Europe. Shah Deniz II would have received a 50% stake in NIC in case it chose Nabucco West as its European gas export route in exchange for joint funding and development of the pipeline. The EU has shown its preference for the de-velopment of Nabucco over the construction of TAP. The reasoning behind this decision is the route of Nabucco, which will cut across former eastern bloc countries, highly dependent on Russian gas. However, the EU said in May 2013 it will be content with any decision of the Shah Deniz consortium on which of the projects to select. OMV, which led the Nabucco West consortium, announced that the project is over for them, but they might after all build their own pipeline depending on the outcome of Black Sea exploration off Romania’s coast. The South Stream pipeline will transport natural gas from Russia under the Black Sea to the Bulgarian coast and further northwest through Serbia, Hungary, Slovenia and Austria to Italy. A branch to Croatia is also planned. The pipeline is expected to carry 63 bcm of Russian gas per year. To build the onshore gas pipeline section, Russian Gazprom has signed agreements with Bulgaria, Serbia, Hungary, Greece, Slovenia and Croatia. The total length of the Black Sea section will exceed 900 km. The construction of the South Stream pipeline was officially inaugurated in Russia in December 2012. Gas deliveries to Europe are planned to start well before 2019, when the gas from Azerbaijan is expected to begin flowing to the EU countries. In March 2013 it became clear that Macedonia could also take part in the South Stream project, as it is close to reaching an agreement with Gazprom on the construction of a branch of the pipeline. Now the Macedonian participation is pending approval by both the Russian side and the Macedonian authorities. Construction works on the Serbian section and the transit route through Bosnia and Herzegovina are expected to start at the end of 2013 or the beginning of 2014. The White Stream gas pipeline, developed by the White Stream Consortium, featuring UK White Stream Pipeline Company Limited and US GUEU Inc, is planned to transport gas from Georgia to Romania, Ukraine and other markets in Central and Eastern Europe. The White Stream gas pipeline will be built in three stages. The first one includes a pipeline across the Black Sea from Georgia to Romania, and affiliated onshore pipeline sections and compression facilities, to be completed in 2018. It is projected to transport 8 bcm or 16 bcm per year, depending on what pipeline diameter will be chosen. The next stages include offshore pipelines across the Black Sea to Romania, and possibly Ukraine. More onshore facilities are planned to be constructed. The system capacity is foreseen to surge to 32 bcm per year. The offshore section includes two alternative routes crossing the Black Sea. The first one would land close to Constanta, on the Romanian coast, and will be connected to the existing Romanian gas system. The second possible route would reach the Crimean peninsula, on the Ukrainian coast. The 2,000-km TANAP is projected to trans-port natural gas from Azerbaijan and probably its neighbours through Turkey to Europe. TANAP is run by a consortium of SOCAR and Petroleum Pipeline Corporation of Turkey (BOTAS). Turkish Petroleum Corporation (TPAO) might also join them in the future. In 2007 Hungarian oil and gas company MOL proposed the New European Transmission system (NETS) project. It is an initiative aimed at joining the gas pipeline systems in central and Southeast Europe, thus uniting transmission system operators (TSOs) in the region and creating a common transmission system operator in order to upgrade and develop the regional gas infrastructure. Another similar initiative is the European Transmission System Operator, promoted by some major gas players, which could help im-prove assets integration and network management. Natural gas is expected to surpass petroleum and coal use within the next couple of decades. The growing consumption of gas is driven by its key advantages – it is used across many sectors, it is more environmentally friendly than coal and oil, and it is less water-intensive than other fuels. Furthermore, the introduction of new drilling techniques has enabled the production of shale gas which could cover local gas demand in some SEE countries. The pipeline projects could be launched only after the successful completion of environmental assessment which guarantees strict environmental standards. World population growth and GDP rise are the two reasons that could lead to increased energy demand. The world population is expected to rise to 8.3 billion people by 2030 from 7.1 billion in May 2013. According to BP, the world’s GDP in 2030 is projected to be approximately double the 2011 level in real terms. The primary energy consumption is expected to climb by 1.6% annually by 2030. All this makes gas pipeline projects a necessity all around the world and especially in SEE, where the gas infrastructure is old and needs improvement. With the higher energy consumption, the Balkans would take up a strategic position in Europe for gas transportation from the Caspian region. According to BP, energy production will go up everywhere but in Europe in the future. That is why the European countries have to continue importing energy in order to meet the demand. The countries in SEE currently buy gas mainly from Russia, which gives it the upper hand in determining prices. Diversification of the sources would create competition between the suppliers, which would bring down prices. The continuity of gas supplies is also a major potential problem when there is a single supplier. The construction of pipelines will also open new job opportunities for people in the region. The Nabucco project alone is expected to create thousands of jobs. In Greece, TAP is expected to create about 12,000 direct and indirect jobs. The pipelines might boost SEE countries’ GDP as well. According to a study conducted by Oxford Economics, the TAP project in Alba-nia will bring 57 million euro to the Albanian economy and create 4,200 jobs. Economic growth could be achieved through energy efficiency and new energy supplies. The gas pipeline projects in SEE are one of the means to accomplish this goal. *The analysis is up to date as of August 1, 2013.